Auctions – full of surprises! Well it was one of those days where you manage to do what you said you’d never do – and that’s impulse bidding at an auction. I mean there you are zeroing in on that little vintage model you’ve been after for ages, the estimate is £80 to £140 and you’ve got the cash in your pocket and Bam! the bids suddenly thick and fast between 5 or 6 phone lines and the internet goes cosmic, through the roof and so far above your budget that you feel really quite inadequate – out of your league. And before you know it, your day, full of expectations that it was, is no more. Gone in a flash of someone else’s money and your item well out of reach. Then, would you believe it and before you can even go off for a shell-shocked sulk and a cup of coffee, the next item’s up and, Hello? one that you’d never even noticed, such was your tunnel vision towards the previous one – and suddenly there’s this absolute gem – it’s there – right in front of you. . . .
Wow – I’ve been looking for any one of HIS – for ages! And the estimate is what? That’s not too bad you know – just maybe I could wing it and swing it! Then you think – oh oh, what’s wrong with it? Maybe it’s a “come and buy me” estimate to lead you on . . But no time to check it out . . . damn . . . . Nothing much said in the description and that estimate seems awfully low, so big decision – do I take the chance? And looking around I don’t see that anybody else has actually spotted it either – after all I didn’t, sandwiched as it was between the big boys or should I say the big name boys, because that’s what the Dealers here were obviously snapping up – to resell at inflated big City prices to their retail suited pals. You know the usual Omega (there are soooo many of the darned things), the Rolex’s (are they really that good?) and then Tag and the Muller – you get my drift. But this one is just, well, sitting there, almost hidden by the weight of the buzz names – so maybe . . . just maybe . . . .
Sod it! – I’ll have a go – what’s to lose? Well the first bid is just plain silly, derisory really and after that it basically just creeps up. This in itself can be deceiving as it could suddenly take off, but sometimes, just sometimes it bombs and often without a reserve somebody gets themselves a real bargain. And that’s my hope here. So wary of that possibility I quickly jump in don’t I – I mean it’s the obvious thing to do – because – you never know . . . and then, bid, bid, bid and before you know it – it’s all over and the auctioneer is looking at the buyer, saying SOLD to . . . . . and I’m looking around me like an idiot – SOLD to – as I catch his eye – Yes! it is – Moi! Yours truly – as I fumble with my auction “paddle” which was stuck in my jacket, ripping the pocket as I struggled to get hold of it and hold it up! Wow! This is just so brilliant. I’ve just paid …..HOW MUCH? ( I can still hear the echo from my Wife’s shriek!) for something NOT on the menu – and the lot number, whatever it was is off the large screen and the auction is going on without me. Is this a dream or what? And was that my bank manager smirking as he turned away at the back of the auction house – I’m sure it was . . . . I never knew he even went to auctions . . .! Anyway – it was no dream and you might just wonder what on earth I bought after all this excitement. Well here’s a clue or two . . . . The watch was designed and signed by a guy who was perhaps one the best designers of watches – ever. In 1966 he designed the Universal Geneve Golden shadow range of watches, then in 1972 designed the Audemars Piguet Royal Oak and in 1976 the Patek Philippe’s Nautilus, then cases and dials of the Omega’s Constellation and Seamaster watches. So quite a pedigree! He also contributed to the designs for the Ingéneur, The Pasha Cartier and the 222 Vacheron Constantin, Piaget, Chopard, and so on and on . . . . He had his own Watch Company from 1981 till 1998 and another from 2001 under a different name. All his watch models are quirky, unique and novel, very technical and high specification and often quite expensive. Octagonal cases he particularly liked and played around with, even producing a Mickey Mouse model or two just for fun. My model was from 1995 so bang in the middle of his best production period – and it’s actually quite rare! There’s only a handful been sold at auctions in the last 10 years and this one changed hands twice before it got to me. In fact apparently not many were produced, so is very much a limited model. So I better check this out – now in my hand. OK, the watch goes as soon as it’s touched – always a good sign. The quick date pusher works perfectly – OK. Oh oh – the alarm stem is and feels completely disconnected, so no rotation of the alarm disc, winding or setting- OK? BUT – maybe I don’t understand how to set the alarm. Often these watches have a sequence to follow to move the alarm set pointer – so I’ll have to investigate further before passing judgment. The case is in very good condition – a tiny dint in the sapphire glass – OK, a screw missing from the stainless steel back (should be six only 5) – OK and the original leather strap (with tolerable wear) and deployment is for a large wrist – OK. Soo it all looks fixable . . . . . .Phew! So after all that – here are a few images of my impulse buy. So this is a Gerald Genta Bartolomeo Alarm Calendar watch with slate dial, gold filled numerals and markers, gold hour, minute and seconds hands plus a GG logo in gold on the red tipped Alarm pointer. The Alarm function is by a central rotating disk and operated and set by the secondary capped 3 position Crown at between 1 & 2 o’clock. The watch has an automatic Omega Cal.980 movement so no winding required. The time is set by the main capped Crown at 3 o’clock. A Date aperture is between 3 & 4 o’clock and there is a quick set date adjuster just below the 2 o’clock position on a raised Crown mount in the form of a small pusher. 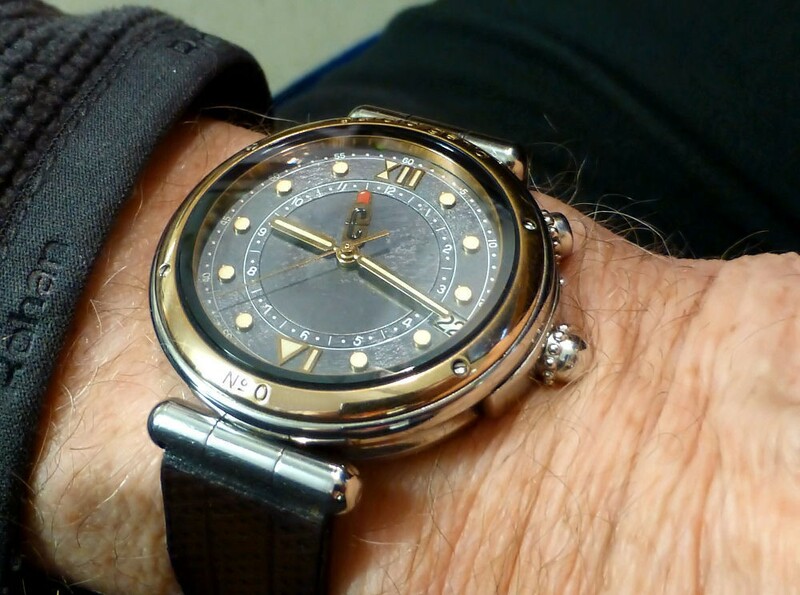 The dial indicators are luminous filled (perhaps Tritium) and the gold colored bezel is secured with 4 screws. The crystal is sapphire and slightly domed. 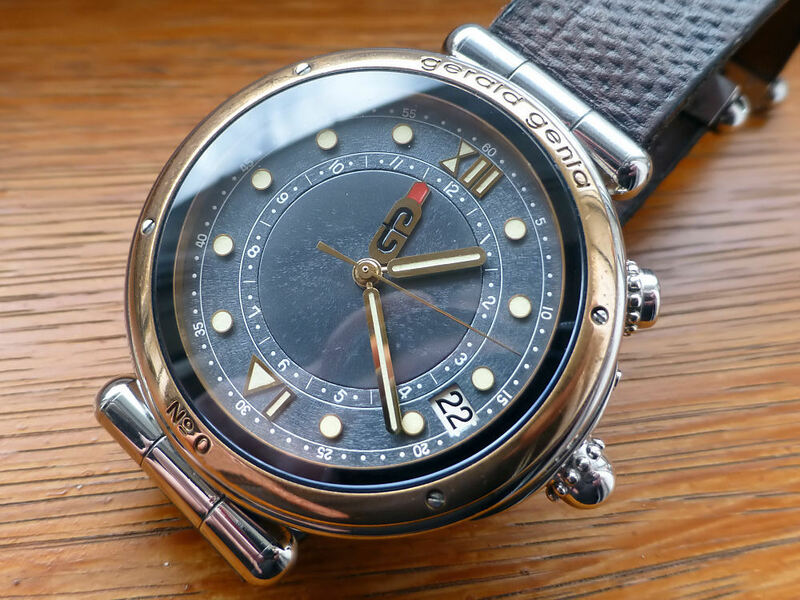 The watch case appears to be stainless steel as is the back with 6 securing screws and serial & model details inscribed plus the Gerald Genta logo. The Gerald Genta original T bar leather strap has a signed stainless steel double deployment clasp and the watch diameter is around 40mm ex. crowns. A point to note is the case materials used are not known. I’m unable to find detailed information on this model, so whether stainless, gilt or solid gold, the case and bezel materials are a bit of a mystery. Without metal marks I assume a stainless steel case and unknown bezel. However and whatever, the price I paid is still a pleasant surprise. The very few previous auction sales I’ve seen for this model have been considerably higher, though metal specification obviously a factor. But I’m pretty happy and a bit of a bargain considering it’s quite a rare model, so I’m really pleased with my impulse buy! Gerald Genta watches are an iconic brand and to actually have one is an unexpected surprise and a pleasure – and my Wife has forgiven me since she set eyes on it – she liked it as much as I do.